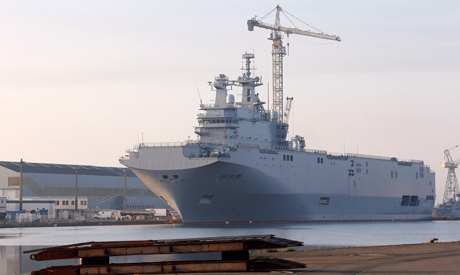 Egypt has agreed to buy two Mistral warships which France built for Russia before scrapping the sale over the Ukraine crisis, the French presidency said in a statement Wednesday. President Francois Hollande and Egyptian President Abdel Fattah El-Sisi "have agreed on the principle and terms and conditions of Egypt's acquisition of the two Mistral-class vessels," the statement said. The two warships, which can each carry 16 helicopters, four landing craft and 13 tanks, were ordered by Russia in 2011 in a 1.2-billion-euro ($1.3-billion) deal. However France found itself in a sticky situation as the date of delivery neared in 2014, and ties between Russia and the West plunged to Cold War lows over Moscow's annexation of Crimea and support for separatists in eastern Ukraine. Paris faced the wrath of its allies around the world if it were to deliver the technology to Russia, and decided to cancel the delivery. It was an expensive decision for France, which has had to foot the bill of over one billion euros for the upkeep of the ships and the cost of training 400 Russian sailors to crew them. After eight months of intense negotiations, France and Russia agreed on the reimbursement of the deal in August. Paris returned 949.7 million euros which had already been paid. France also committed not to sell the two warships to a country that could "contravene Russia's interests", such as Poland or the Baltic states, a diplomatic source told AFP. Several countries were said to be interested in the warships, including Canada, India and Singapore. It has not been divulged how much Egypt will pay for the warships. While experts have said any sale would likely see a significant price cut, government spokesman Stephane Le Foll said there would be no "loss" of money in the new accord. The deal between Egypt and France is their second big military contract this year after Egypt became the first buyers of the Rafale fighter jet, agreeing to purchase 24 in February. The 5.2-billion-euro ($5.9 billion) sale of the planes was a rare triumph for France which had failed to export its flagship multi-role combat jet. However rights group Amnesty International slammed the decision to sell the jets to a nation it has accused of "alarming" human rights abuses. Analysts said that deal required overlooking some serious abuses by a regime which Paris sees as a stable partner in a chaotic region. With Libya to the west wracked by instability, and the threat from Islamic State-linked jihadists on its eastern flank, Egypt has become a strategic partner to France despite a rights record sullied by a regime crackdown on opponents. Sisi was elected president in May 2014 with 96.91 percent of the vote a year after Islamist President Mohamed Morsi was toppled in July 2013 after mass protests against his rule. everything about this stinks. any sweet aroma must be some unspoken bargain. to use these ships, egypt not only needs to buy hundreds of helicopters, but use those helicopters for war at sea, and like russia, have the ships specially fitted for the types of helicopters being used. as for war at sea, this week russia delivered a new class of missiles to syria (and iran) where a single one can sink an aircraft carrier. i.e., egypt just bought two sitting ducks. and, I find it repugnant, that france (after unknown threats from the dual citizens running the U.S.) reneged on a paid contract, as 'punishment' / 'sanctions' against russia, and egypt rewarding this illegal act of cowardous, while giving russia the finger. and where did Egypt find the money to waste? Egypt is NOT buying these useless aircraft carriers, Saudi does. Saudi knows from their dismal failure in a small war in Yemen that they are incapable of operating such complex carriers, thus they are buying them, paying for the monthly maintenance, paying for docking them in Egypt, and paying the Egyptian military to operate them. They will only come and visit them in Egypt once a year with no clue on what they do and how to use them, just like their useless fleet of Mega Yachts in the Med operated and maintained by the French. This must be it; Egypt is not that stupid for wasting billions on this useless gear while every civic institution is crumbling!